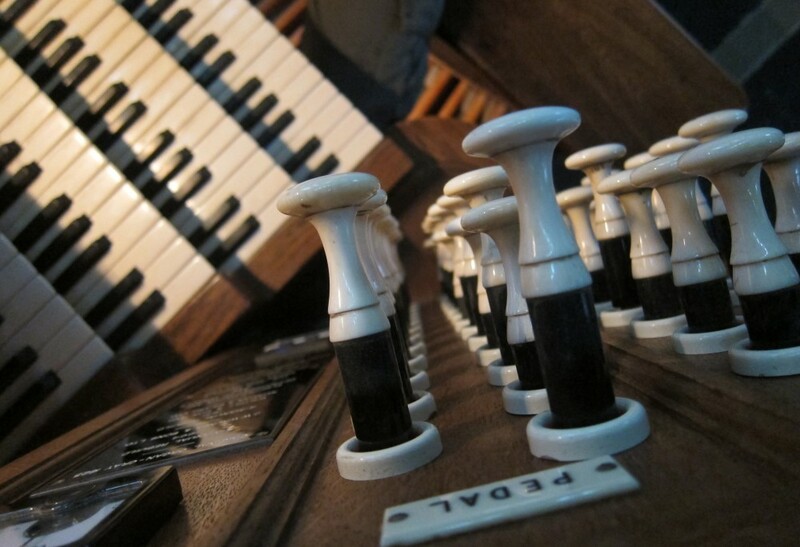 Advent – that wonderful season of preparation, filled with Christmas Carol Services that strictly shouldn’t be, but without them our Christmas income as organists would be severely depleted! It has to be the busiest time of the year for a jobbing organist, when many local schools and organisations feel the need to visit their local church, quite often after a hearty lunch or a boozy Christmas office party to lurch or burp their way through a selection of their favourite seasonal ditties. I always love them – no, seriously, I do! I get to meet people who wouldn’t normally set foot in a church – different choirs, soloists and school music teachers, (that sterling bunch of undervalued workers, who every year have to create choirs of angels out of reluctant squawkers, and instumental ensembles using whichever instument seems to be popular in the school at the time). I kid you not, when I tell you that I once had the joy of playing ‘Silent Night’ with an ensemble of some 15 descant recorders, a violin, 2 saxophones, a harp and… an electric guitar! The recorders won that particular battle for supremacy with a virtuoso display of overblowing, capped only by the giggles of the young players, as the bottom fell off one of the recorders. It can be a particularly stressful time for the beleagured school music teacher, and it’s no wonder that they often look haggared and careworn at this time of year! They have to conjure up a musical feast which has to be better than last years, at a time when their colleagues are tidying their own classrooms and hanging up their decorations, whilst poor Mrs Muggins still has to rehearse the flu-ridden depleted choir, with the recent news that her prize soloists won’t be there at the service due to a family holiday. I feel your pain, Mrs Muggins – I have been there! How many of us have pleaded with our young choirs to ‘SMILE’ as they sing in a sub-zero church about the joy of Christmas but with faces like thunder?! One school teacher I played for used threats and sheer fear with his boys’ choir – I have never been so scared of playing wrong notes as with this character – let’s call him Dr Death. He was straight out of Dickens, and had the power to reduce his boys to a line of wobbling, quivering wrecks with just a raised eyebrow and a flared nostril. We rehearsed EVERYTHING, right down to which word of the readings the boys would need to look at him, ready to stand together for each carol. The ‘standing-ups and sitting-downs’ were a military exercise and woe betide anyone who was not ascending or descending precisely alongside his choirmates. Yikes – one boy even had the audacity to drop a pencil during the service, and I thought he was going to have another personal accident shortly afterwards, as all the boys looked straight at Dr Death and held their breath waiting for the wrathful glare. I, too was in fear and trepidation of using different stops from the rehearsal and even wrote metronome markings on my music. At the end of the voluntary, I bravely ran away without saying ‘goodbye’ or “sorry, I messed up the fourteenth semiquaver in bar 48 of page 39, second line down, second system”. “Shurrup, will yer’ – it’s suppowsed ter be a sowlow”. But what of getting words wrong and typing errors in the Order of Service? Well, I’ve seen a “Hark the Herald Angles Sing”, “While shepherds watched their folks by night”, “Not in that poor lowly stale”, “Yea, Lord, we greet thee, born this hippy morning” and my personal favourite, “Lo! he abbhors not the Virgin’s wob”! And my final little tale, recalls a nervous but wonderful tenor, in a very large and important service I played for at All Soul’s, Langham Place in London. It was a huge gig and so in addition to the enormous organ we had a full symphony orchestra, brass band, fanfare trumpeters, a choral society, and some celebrities doing readings. I was really excited about accompanying this particular fantastic tenor on this equally gorgeous organ, with the choral society acting as the ‘backing chorus’. The tenor arose from his seat, and I gently purred the opening rippling bars of “O Holy Night”. The audience were hushed and the atmosphere was expectant of something quite superb and memorable. They were not to be disappointed – his singing was beautiful and his diction measured and clear..
especially Organists and School Music teachers!